In the past few years, new fossil finds and novel methodological approaches have prompted intensive discussions about the phylogenetic affinities of turtles and rekindled the debate on their ecological origin, with very distinct scenarios, such as fossoriality and aquatic habitat occupation, proposed for the earliest stem-turtles. While research has focused largely on the origin of the anapsid skull and unique postcranial anatomy, little is known about the endocranial anatomy of turtles. Here, we provide 3D digital reconstructions and comparative descriptions of the brain, nasal cavity, neurovascular structures and endosseous labyrinth of Proganochelys quenstedti, one of the earliest stem-turtles, as well as other turtle taxa. Our results demonstrate that P. quenstedti retained a simple tube-like brain morphology with poorly differentiated regions and mediocre hearing and vision, but a well-developed olfactory sense. 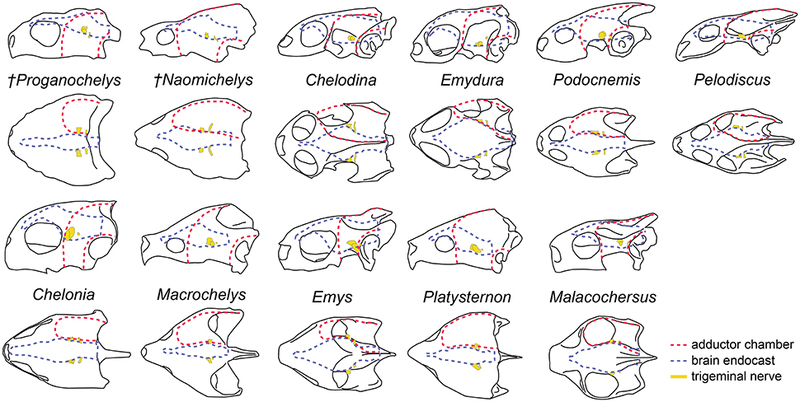 Endocast shape analysis indicates that an increase in size and regionalization of the brain took place in the course of turtle evolution, achieving an endocast diversity comparable to other amniote groups. Based on the new evidence presented herein, we further conclude that P. quenstedti was a highly terrestrial, but most likely not fossorial, taxon. Turtles (Testudinata sensu Joyce et al., 2004) are a diverse group of reptiles with an unusual “bauplan” fundamentally different from that of other amniotes. Unique morphological characters, including the anapsid cranial configuration, which lacks temporal fenestrations, and the presence of a bony shell formed by a dorsal carapace and a ventral plastron have long obfuscated the phylogenetic affinities of turtles (Rieppel, 2007; Lyson et al., 2010). While most molecular studies have recovered turtles nested within diapsid reptiles and often as a sister-group to Archosauria (birds and crocodiles) (Hedges and Poling, 1999; Wang et al., 2013; Field et al., 2014), most studies based on comparative anatomy have placed turtles outside of Diapsida (Gauthier et al., 1988; Lee, 1997; Werneburg and Sánchez-Villagra, 2009; Neenan et al., 2013; Scheyer et al., 2017) or alternatively inside Lepidosauromorpha (deBraga and Rieppel, 1997; Rieppel and Reisz, 1999; Li et al., 2008; Liu et al., 2011). The scant fossil record of stem-turtles (i.e., non-Testudines Testudinata) has further obscured the evolutionary origin of this group. Recent discoveries of new species and reanalysis of existing specimens with novel methodological approaches (e.g., computed tomography and digital visualization) have provided new data to the debate of turtle ancestry (Li et al., 2008; Bever et al., 2015; Schoch and Sues, 2015). These studies found support for the diapsid origin of turtles and produced potential evidence for closure of the temporal fenestrae early in their evolutionary history (Schoch and Sues, 2015; Werneburg, 2015; Lyson et al., 2016). Regarding the environmental origin of the group, although all Triassic turtles were clearly terrestrial (Joyce, 2015), data provided by recently described taxa have painted an ambiguous picture regarding the paleoecological setting in which the Testudinata ancestors evolved. While the earliest known potential proto-turtle (i.e., non-Testudinata Pantestudines) Eunotosaurus africanus (ca. 260 Ma) has been found in terrestrial environments (Lyson et al., 2016), the somewhat younger Pappochelys rosinae (ca. 240 Ma) and Odontochelys semitestacea (ca. 220 Ma) were retrieved from lacustrine and deltaic deposits and were considered to have been semi-aquatic (Li et al., 2008; Rieppel, 2013; Schoch and Sues, 2015). In the last two taxa, the dorsoventrally flattened, expanded ribs, and thickened gastralia have been interpreted as adaptations for buoyancy control in an aquatic environment (Schoch and Sues, 2015). In contrast, the morphology of the ribs, as well as the more rigid body wall, powerful forelimbs and triangular skull, have been considered to represent adaptations to fossoriality in E. africanus (Lyson et al., 2016). On the other hand, the type localities of both P. rosinae and O. semitestacea have also yielded terrestrial taxa (Joyce, 2015; Schoch and Sues, 2017) and, in fact, terrestrial diapsid remains are dominant at the type locality of the former (Schoch and Sues, 2015). Additionally, Joyce (2015) argued in favor of Odontochelys semitestacea as a terrestrial proto-turtle, based on its phalangeal formula. Hence, terrestrial, fossorial and semi-aquatic habits have all been suggested for the early stages of turtle evolution, before the origin of the protective shell characteristic of the definitely terrestrial stem-turtles (Joyce and Gauthier, 2004; Scheyer and Sander, 2007; Joyce, 2015). While research on early turtles has focused largely on the acquisition of the anapsid condition and the evolution of the postcranial anatomy employing comparative morphology, histology and genetics, little is known about the endocranial anatomy of stem-turtles (or indeed turtles in general). Using micro-computed tomography (μCT) scanning and digital visualization, we here provide a reconstruction of the endocranial anatomy of Proganochelys quenstedti, one of the earliest testudinates from the Late Triassic of Germany. We further compare the reconstructed brain anatomy with different stem- and crown-turtles (Testudines) and other vertebrate taxa using endocast outline analysis to elucidate related anatomical and ecological aspects of turtle origins. For digital reconstruction of endocranial anatomy (brain, inner ear, neurovascular structures, nasal cavity) two specimens of Proganochelys quenstedti from the Late Triassic of Germany were studied: MB 1910.45.2 (Museum für Naturkunde Berlin) from the Baerecke and Limpricht Quarry, Halberstadt (Jaekel, 1918), and SMNS 16980 (Staatliches Museum für Naturkunde Stuttgart) from the Plateosaurus-quarry in Trossingen (Gaffney, 1990). Both specimens consist of nearly complete and articulated cranial skeletons. MB 1910.45.2 shows substantial taphonomic artifacts in the form of anteroposterior shearing and some moderate mediolateral crushing and deformation. However, these artifacts only marginally affect the braincase and the digital reconstruction of the various endocranial structures (see Results for more details). MB 1910.45.2 was CT scanned at the Leibniz-Institut für Zoo- und Wildtierforschung Berlin/Germany (IZW) using a Toshiba Aquilon ONE medical CT scanner. Scanning parameters were set at 225 kV and 300 μA resulting in an image stack of 512 × 512 × 213 pixels and a voxel size of 2.0 mm per slice. The dataset was subsequently “upsampled” (1024 × 1024 × 426 pixels, 0.5 mm effective voxel size) by averaging the existing slice data. This process does not increase the actual resolution of the data, but provides more slices available for segmentation permitting clearer identification of features and resulting in smoother surface models. SMNS 16980 was scanned at the Riedberg Campus of Goethe-Universität Frankfurt/Germany using a Phoenix Nanotom m scanner (Werneburg et al., 2015a). Due to its relatively large size, the specimen was scanned in three stages. The resulting image stacks were combined into a single stack with 3583 × 4011 × 5658 pixels and a voxel size of 0.025 mm per slice. The dataset was subsequently downsampled (870 × 954 × 1161 pixels, 0.1 mm voxel size) to permit further processing and segmentation. Datasets for both specimens were imported into Avizo 8 (Visualization Science Group) for the segmentation of endocranial structures. Due to poor grayscale attenuation (in particular for SMNS 16980), segmentation was performed manually using the paintbrush and interpolation tools in the Avizo segmentation editor (both reconstructions performed by the first author for consistency following Balanoff et al., 2016). 3D surface models and volumes were created to visualize the endocranial components. In addition, surface models of the individual structures were downsampled to a degree that allowed for small file sizes but preserved all details, and were exported as separate OBJ-files for the creation of the interactive 3D-figures provided in the Supplementary Material as outlined in Lautenschlager (2014b) using Adobe 3D reviewer (Adobe Systems Inc.). To provide a basis for comparisons, the endocranial anatomy of nine extant turtles and of one additional stem-turtle, Naomichelys speciosa (FMNH PR273), was reconstructed in the manner described above. FMNH PR273 was scanned at the Institut für Naturwissenschaftliche Archäologie at the Universität Tübingen at a resolution of 0.1 mm resulting in an image stack of 1068 × 1382 × 622 pixels. The following extant species were scanned at the Steinmann-Institut für Geologie, Mineralogie & Paläontologie/Rheinische Friedrich-Wilhelms-Universität Bonn/Germany and at the Museum für Naturkunde Berlin/Germany: Podocnemis unifilis (SMF 55470), Chelodina reimanni (ZMB Herpetologie 49659), Emydura subglobosa (PIMUZ lab# 2009.37), Pelodiscus sinensis (IW576-2), Chelonia mydas (ZMB 37416 MS), Macrochelys temminckii (TCGT, Teaching collection Geowissenschaften Towisse), Emys orbicularis (WGJ, 1987a), Platysternon megacephalum (SMF 69684), Malacochersus tornieri (SMF 58702) (see Supplemental Material for Collection abbreviations). Data derived from the reconstructions were further used for a shape analysis of brain morphology. Due to the absence of unambiguous and consistently identifiable landmarks on the endocast across different amniote taxa, outline shape analysis was performed to quantify morphological differences. Although this approach uses only two-dimensional outlines (in contrast to three-dimensional landmarks), it allows quantification of shape data for geometries lacking homologous landmarks (Haines and Crampton, 2000). For shape analysis, a sagittal cross-section through the surface model of each brain (i.e., digital cast of the endocranial cavity) was produced in Avizo for each reconstruction. Contours of the two-dimensional cross-sections were imported into tpsDig2.16 (Rohlf, 2010), digitized and saved as 1000 x/y-coordinate pairs. All outline data were subsequently analyzed in PAST 3.17 (Hammer et al., 2001) using fast Fourier transformation (FFT) and principal components analysis (PCA) with the hangle module as outlined in Crampton and Haines (1996) and Lautenschlager (2014a). Outlines were smoothed ten times to eliminate pixel noise, and 23 Fourier harmonics were found to describe the outlines of all sampled taxa sufficiently (average Fourier power > 99%) (see also Supplementary Material). In addition to the reconstructed endocasts, further outlines of 52 taxa were collected from the literature (Hopson, 1979; Franzosa, 2004; Neenan and Scheyer, 2012; Bona and Paulina-Carabajal, 2013; Carabajal et al., 2013; George and Holliday, 2013; Herrera et al., 2013; Holloway et al., 2013; Lautenschlager and Butler, 2016; von Baczko and Desojo, 2016; Jirak and Janacek, 2017; Laaß et al., 2017; Paulina-Carabajal et al., 2017; Pierce et al., 2017; Digimorph1) for different turtle, archosauromorph, lepidosauromorph and other amniote taxa (for list of taxa see Table S1). These outlines were redrawn in Adobe Illustrator to ensure sufficient resolution for the digitization process. For PCA, each taxon was assigned to a phylogenetic and an ecological (marine, freshwater, terrestrial, fossorial) group. To test for significant differences between those groups, we also conducted a non-parametric MANOVA test (Anderson, 2001) using PC scores representing 95% of total variance transformed into an Euclidean distance matrix, replicated with 10,000 permutations and compared using Bonferroni correction for the post-hoc analyses. The reconstruction of MB 1910.45.2 (Figures 1A–D) provided most details of the endocranial anatomy, but exhibited some moderate medio-lateral deformation. In comparison, the reconstruction of SMNS 16980 (Figures 1E–H) showed no obvious artifacts, but the poor grayscale contrast permitted only a few structures (i.e., brain, pituitary fossa and some cranial nerves) to be visualized. In combination, both specimens allowed for a detailed reconstruction of most endocranial components. Figure 1. Endocranial anatomy of Proganochelys quenstedti specimens (A–D) MB 1910.45.2 and (E–H) SMNS 16980. Endocast and nasal cavity (A,B) in situ in left lateral oblique view with bone rendered semi-transparent and isolated endocast in (B,F) left lateral, (C,G) dorsal and (D,H) ventral views. car, carotid artery; duc, ductus nasopharyngeus; dur, dural peak; endo, brain endocast; lab, endosseous labyrinth; nas, endocast of nasal cavity; pit, pituitary fossa; I, olfactory nerve; II, optic nerve canal; III, oculomotor nerve canal; IV, trochlear nerve canal; V, trigeminal nerve canal; VI, abducens nerve canal; VII, facial nerve canal; IX-XI shared canal for the glossopharyngeal, vagus and spinal accessory nerve; XII, hypoglossal nerve canal. The brain endocast is anteroposteriorly elongate and straight in both specimens, with only moderate cephalic and pontine flexures (Figures 1B,F). The endocasts are tubular and mediolaterally narrow without prominent expansion or constriction of the fore-, mid- or hindbrain regions. The close similarity of these features in both specimens confirms that this morphology is natural and unlikely to be a result of taphonomic deformation. The olfactory nerve (CN I) contributes approximately a third to half of the full endocast's length, but a clear distinction between the base of the olfactory nerve and the cerebral hemispheres is not visible. The olfactory bulbs are only weakly reproduced by the ventral surfaces of the nasals. Cerebral hemispheres or distinct optic lobes are not visible in either specimen, suggesting that both structures were very small and/or that the venous sinus and the dura mater obscured the underlying morphology. The midbrain region is confluent with the forebrain and only weakly demarcated. The only distinguishing feature is a dorsal expansion extending above the level of the olfactory nerve. This dural peak or cartilaginous rider (Zangerl, 1960; Gaffney and Zangerl, 1968; Paulina-Carabajal et al., 2017) is more prominently developed in MB 1910.45.2 (Figure 1B). In SMNS 16980, the dorsal expansion is shallower and somewhat separated from the main body of the midbrain by a bony margin, suggesting that this structure corresponds to the cartilaginous portion of the supraoccipital, which ends abruptly anteriorly in Proganochelys quenstedti (Gaffney, 1990). The pituitary fossa is visible in SMNS 16980 and forms a pendant pocket, projecting ventrally from the main body of the midbrain endocast. The hindbrain region is anteroposteriorly short and not constricted mediolaterally between the endosseous labyrinths. Floccular lobes are not visible. Posteriorly, the hindbrain exits the braincase through the foramen magnum, which is oval and wider than high in SMNS 16980 and slightly higher than wide in MB 1910.45.2. The latter may be the result of the mediolateral compression of this specimen. The nasal cavity is very enlarged when compared to the other sampled taxa (Figures 2, 3; Table 1). The strong lateral compression of MB 1910.45.2 may be responsible for the seemingly increased volume, and, hence, we consider the reconstruction of the nasal cavity in SMNS 16980 more reliable. Usually, three portions of the nasal cavity can be identified in turtles and other reptilians (Parsons, 1959, 1970; Halpern, 1992; Paulina-Carabajal et al., 2017): the vestibulum nasi, which connects the nasal chamber to the external nares; the ductus nasopharyngeus, connecting the nasal chamber to the choanae; and the cavum nasi proprium, the chamber itself, bounded anteriorly by the vestibulum, posteroventrally by the ductus, and posterodorsally by the olfactory nerve (CN I). The ductus nasopharyngeus can be distinguished from the rest of the nasal cavity in P. quenstedti as two ventrolateral projections (Figure 1). A proper duct (at least not bounded by bone) was not expected, since the choanae in P. quenstedti are very extensive, and occupy almost the whole ventral surface of the nasal cavity. 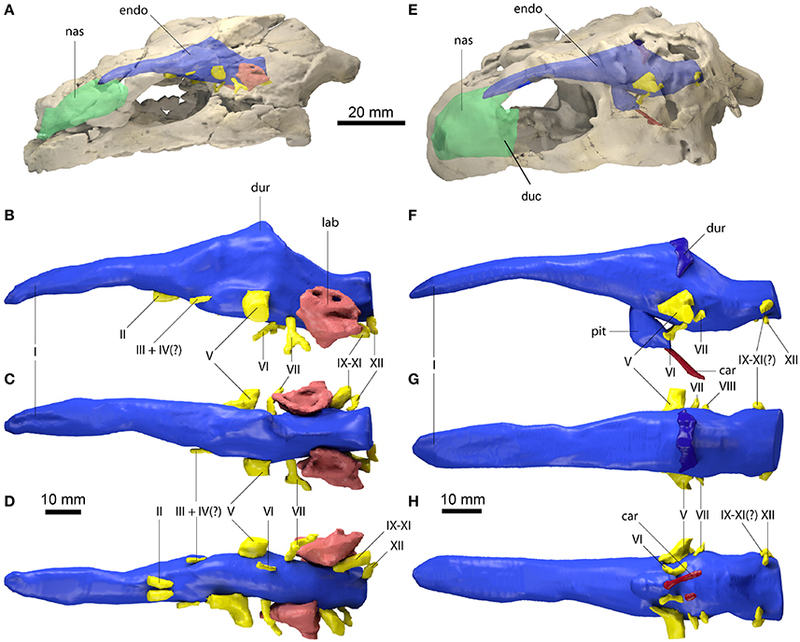 The vestibulum on the other hand is short, as in most other turtles (Paulina-Carabajal et al., 2017), connected to the large cavum nasi proprium, which constitutes most of the nasal cavity. The cavity as a whole is considerably broad and also high in comparison (Figures 2, 3) to several other taxa (Carabajal et al., 2013; Paulina-Carabajal et al., 2017). Figure 2. Comparative endocranial anatomy of different stem-Testudines and pleurodiran taxa. Original reconstructions and redrawn endocasts (Plesiobaena antiqua from Gaffney, 1982; Meiolania platyceps from Paulina-Carabajal et al., 2017; Podocnemidoidae sp. et gen. nov. from Ferreira et al., 2018) in left lateral view. Topology based on Joyce et al. (2016), Guillon et al. (2012), and Ferreira et al. (2018). Heat mapping on branches based on the ratio (CE/BL) between cubic root of endocast volume and basicranial length (Table 1). Figure 3. Comparative endocranial anatomy of different pan-cryptodiran taxa. Original reconstructions and redrawn endocasts (Plesiochelys etalloni from Carabajal et al., 2013; Gopherus berlandieri from Paulina-Carabajal et al., 2017) in left lateral view. Topology based on Joyce et al. (2016) and Guillon et al. (2012). Heat mapping on branches based on the ratio (CE/BL) between cubic root of endocast volume and basicranial length (Table 1). Table 1. Measurements and ratios for sampled taxa. The endosseous labyrinth is reconstructed only for MB 1910.45.2, as the grayscale attenuation did not allow differentiation of the bony housing in SMNS 16980. It is dorsoventrally compressed and compact. The anterior and posterior semicircular canals are small and anteroposteriorly longer than high and have low internal radii. The crus communis is also very low in comparison to other taxa (Carabajal et al., 2013; Mautner et al., 2017; Paulina-Carabajal et al., 2017; Ferreira et al., 2018) which results in an almost horizontal orientation of the anterior and posterior semicircular canals (Figure 4). The lateral semicircular canal barely extends laterally from the vestibulum. The cochlear duct is expanded ventrally, but short. The canal of the fenestra ovalis is clearly visible projecting anterolaterally from the vestibulum. Figure 4. Inner ear and otic region anatomy of Proganochelys quenstedti. Digital reconstruction of the right endosseus labyrinth of P. quenstedti in (A) right lateral, (B) dorsal, and (C) anterior views. Skulls of (D) P. quenstedti and (E) Eubaena cephalica in posterior view, redrawn from Gaffney (1990) with opisthotic and stapes colored in green and blue, respectively. Skulls of (F) Sphenodon punctatus, (G) Emydura macquarii, and (H) P. quenstedti in lateral view, redrawn from Ferreira and Werneburg (in press), with quadrate colored in red. Note the larger proportions of the stapes and its contact with the quadrate bone in P. quenstedti, and its slender and tall quadrate, similar to that of S. punctatus, and distinct from the round one of other turtles, which completely encloses the tympanic membrane. asc, anterior semicircular canal; cc, crus communis; ex, exoccipital; fo, fenestra ovalis; lsc, lateral semicircular canal; pa, parietal; psc, posterior semicircular canal; qu, quadrate; sq, squamosal; ves, vestibulum. The proximal portion of the majority of cranial nerves could be reconstructed for MB 1910.45.2 (Figure 1), whereas only some of the larger nerve canals are visible in SMNS 16980. The optic nerves (CN II) exit the braincase through two large (3 mm in diameter each) foramina anteriorly and ventrally from the cerebral region of the endocast in MB 1910.45.2. Posterior and lateral to CN II, the oculomotor (CN III) and possibly the trochlear nerve (CN IV) (Gaffney, 1990) originate ventrolaterally. In SMNS 16980, CN II-IV could not be reconstructed. The foramina through which those three cranial nerves (II-IV) exit the braincase are formed by the laterosphenoid (=“pleurosphenoid”) (Gaffney, 1990; Bhullar and Bever, 2009). This is the second P. quenstedti specimen with a preserved laterosphenoid, however the fact that this ossification is severely crushed leads us to refrain from commenting further on its morphology. The trigeminal nerve (CN V) is large (ca. 6 mm in diameter) and exits the braincase laterally in both specimens through the prootic foramen. Based on both specimens (as well as other specimens described by Gaffney, 1990) we confirm that this foramen is surrounded exclusively by the prootic bone, contrary to Bhullar and Bever's (2009) interpretation that the laterosphenoid would form its anterior margin. A separation of the ophthalmic branch (CN V1) is apparent on the right side in MB 1910.45.2, but this could be a result of the high degree of distortion of this specimen. The abducens nerve (CN VI), clearly visible in both specimens, originates from the ventral surface of the endocast. It pierces the basisphenoid through the foramen nervi abducens and enters laterally the pituitary fossa, which is bottomed by the sella turcica (Gaffney, 1990). Posterior to CN V, the facial nerve (CN VII) exits the braincase laterally through the prootic. In MB 1910.45.2, a distal branching of CN VII outside the braincase wall is visible, also on the prootic bone. The vestibulocochlear nerves (CN VIII) could not be reconstructed in either specimen. The foramina for the CN VIII branches are usually very small and may lie on cartilaginous structures (Gaffney, 1979), so they are not expected to leave unambiguous traces on fossilized skulls. The glossopharyngeal (CN IX), vagus (CN X) and accessory nerves (CN XI) originate immediately posterior to the endosseous labyrinth and exit the braincase though the anterior jugular foramen in MB 1910.45.2. Although the sutures are not very clear, this foramen is thought to be formed by the exoccipital, basioccipital and opisthotic in P. quenstedti (Gaffney, 1990). In SMNS 16980, a large nerve canal originates in a more dorsolateral position (Figure 1). Due to the low resolution, it is unclear whether this canal represents the anterior jugular foramen or parts of the longitudinal sinus, though the latter is more likely. The hypoglossal nerve (CN XII) is transmitted through a single foramen on each side of the basioccipital (posterior to the jugular foramen) in both specimens. The morphology of the endocast of Proganochelys quenstedti was compared to different turtles and other amniote taxa using shape analysis. The PCA results show that the first three PCs account for 71.7% (Table 2) of the brain endocast outline shape variation (Figures 5, 6). In no PC plot, there is a clear separation between either the phylogenetic or the ecological groups considered. 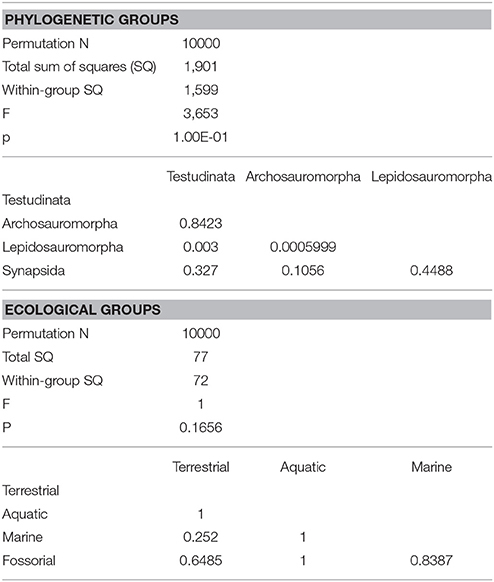 However, the PERMANOVA tests support that Lepidosauromorpha differs significantly from Archosauromorpha (p = 0.0006) and from Testudinata (p = 0.003) although these tests find no significant differences between the ecological groups (Table 3). The outgroup Diadectes is recovered consistently in a position inside the morphospace occupied by other groups, whereas P. quenstedti is displaced from the occupied area in all plots; however, on the PC1 axis, Kawingasaurus is even more displaced in the positive direction (Figures 5, 6). P. quenstedti is distant from other turtles and the minimum spanning-tree (see Supplementary Material) places it closer to the lepidosauromorphs Placodus and Chalarodon, and to the archosauromorph Pseudopalatus, on the PC1/PC2, PC1/PC3, and PC2/PC3 plots, respectively. 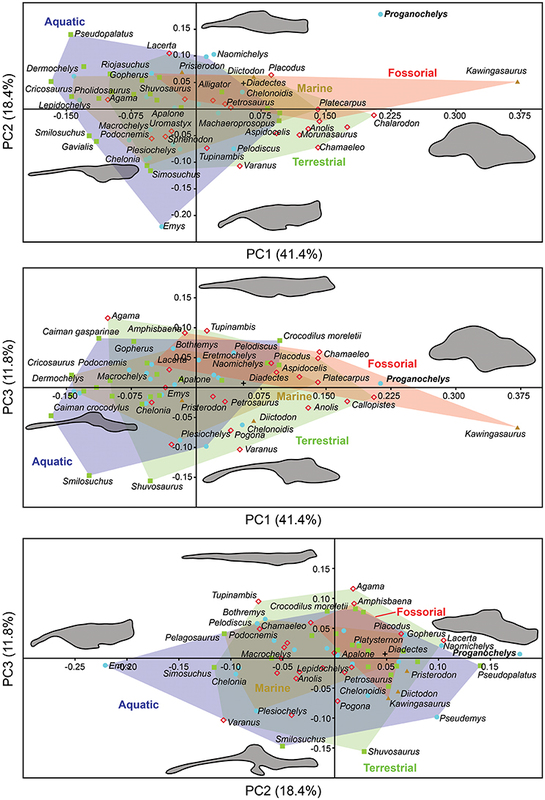 With regard to the ecological morphospaces, P. quenstedti is similarly found in a position outside all the groups, except on the PC1/PC3 plot, on which it is inside the fossorial morphospace and very close to the terrestrial one (Figure 6). Table 2. Summary of the results of the principal component analyses of the brain outlines of different specimens of turtles and other groups. Figure 5. Two dimensional morphospace plots of brain endocast outlines based on the first three PC axes using a priori defined phylogenetic groups. Diadectes is shown as a black cross, Proganochelys quenstedti (SMNS 16980) in bold. The symbols are used to identify the clade to which a point was assigned. Different vertebrate groups are indicated by convex hulls. Figure 6. Two dimensional morphospace plots of brain endocast outlines based on the first three PC axes using a priori defined ecological groups. Diadectes is shown as a black cross, Proganochelys quenstedti (SMNS 16980) in bold. The symbols are used to identify the clade to which a point was assigned. Different ecological groups are indicated by convex hulls. Table 3. 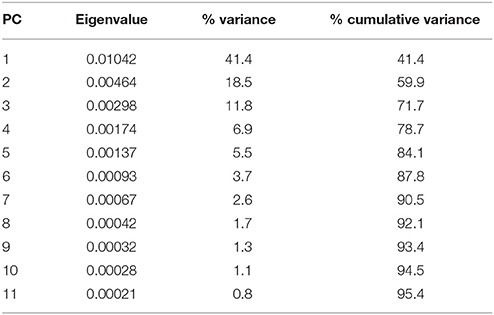 Results of one-way PERMANOVA test (10000 permutations) with 95% of variance (PC1-PC11), excluding Proganochelys and Diadectes (for phylogenetic groups only). Even though more taxa have been assigned to the turtle stem-lineage recently (Li et al., 2008; Lyson et al., 2010; Schoch and Sues, 2015), Proganochelys quenstedti remains one of the most important stem-turtles, given its phylogenetic position as the earliest shelled turtle with a completely preserved skull (Parsons, 1959, 1970; Halpern, 1992; Joyce et al., 2016). Its endocast is a relatively simple structure when compared to that of crown-turtles (Carabajal et al., 2013; Mautner et al., 2017; Paulina-Carabajal et al., 2017; Ferreira et al., 2018). It has a tube-like shape, with only small pontine and cephalic flexures and poorly differentiated brain regions. As in other amniotes, the portion between the fore- and midbrain is the most voluminous, but this is achieved exclusively by an increase in height, since the endocast is nearly constant in width over its entire length (Figure 1). 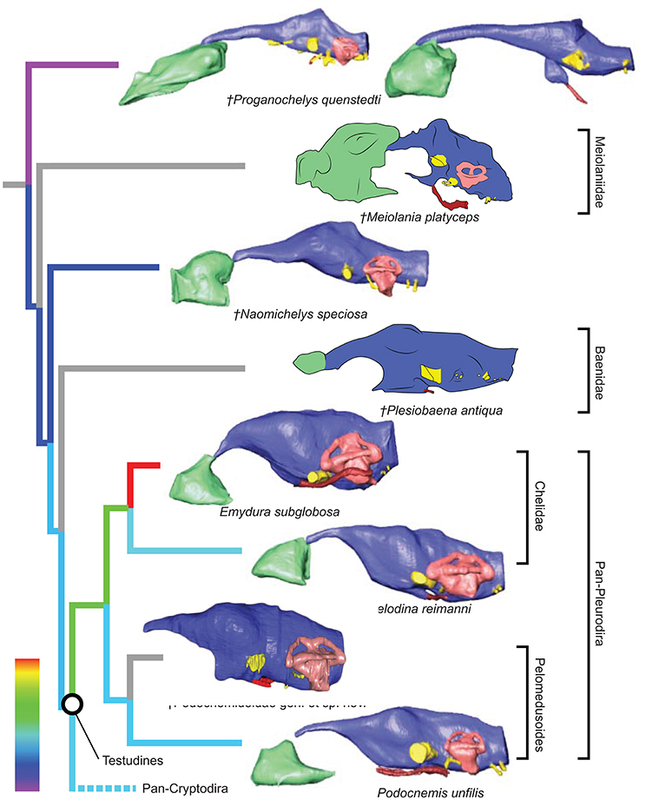 Another striking feature is the pendant pituitary fossa, which is very common in archosaurs (Witmer et al., 2008; Lautenschlager and Butler, 2016; Araújo et al., 2017; Pierce et al., 2017), but does not occur in extant turtles, in which the dorsum sellae and the sella turcica are aligned, positioning the pituitary fossa approximately at the same level as the posterior portions of the endocast (Figures 2, 3). Although the pituitary fossa of turtles can also house other smaller structures (e.g., internal carotid and abducens nerve) the size of the pituitary gland should be at least partially responsible for the larger size of the fossa in P. quenstedti. A similar condition was found for sauropod and theropod dinosaurs (Witmer et al., 2008), in which enlarged pituitary glands have been linked to larger body sizes (Edinger, 1942). While P. quenstedti reached a carapace length of at least 67 cm (based on MB 1910.45.2) (Gaffney, 1990), it was not one of the largest turtles, being much smaller than some extant turtles (e.g., up to 150–200 cm in Chelonia mydas and Pelochelys cantorii) (Angielczyk et al., 2015) and meiolanids (Gaffney, 1996). Turtles included in our sample that are comparable in size to P. quenstedti, such as Podocnemis unifilis and Macrochelys temminckii (up to 68 and 66 cm of carapace length) (Angielczyk et al., 2015), and also Chelonia mydas, do not show a pendant pituitary fossa (Figures 2, 3). An alternative explanation is that it is not the pituitary fossa that is larger in P. quenstedti, but rather the brain that was comparatively smaller. Indeed, in our sample, this taxon has the lowest value for the ratio endocast volume/basicranial length (Table 1), supporting the hypothesis that the brain increased in size during turtle evolution. The brain endocast in turtles does not seem to be consistent with general skull anatomy. Taxa with higher/lower and wider/thinner endocasts do not possess similar skull proportions, which seem more related to the size and shape of the adductor chamber and the associated supraoccipital and squamosal crests (Figure 7). Proportional changes observed in the adductor chamber throughout the turtle lineage rather reflect the distinct volume and size of the external jaw adductor musculature in different taxa (Claude et al., 2004; Foth and Joyce, 2016; Foth et al., 2017; Ferreira and Werneburg, in press). Also, the position of the exits of the cranial nerves change only slightly, even with profound changes in the arrangement of related structures such as the eyes and muscles. For example, in P. quenstedti the external jaw adductor musculature innervated by the trigeminal nerve (CN V3) is vertically oriented and entirely positioned anteriorly to the quadrate (Ferreira and Werneburg, in press), while in crown-turtles it extends far posteriorly, following the enlargement of the supraoccipital and squamosal crests (Poglayen-Neuwall, 1953; Werneburg, 2011, 2013). However, the relative position of the exit of CN V remains roughly the same through turtle evolution when compared to the remainder of the endocast and the surrounding bones (Figure 7). Hence, the actual change that occurs when the muscles expand posteriorly involves only growth and reorientation of distal V3-branches and not a repositioning of the trigeminal nerve foramen (Poglayen-Neuwall, 1953; Schumacher, 1973). Figure 7. Overall skull shape and relation to cranial structures in different turtle taxa. Brain endocast and adductor chamber plotted in left lateral (first and third rows) and dorsal (second and fourth rows) views. Note the similar position of the trigeminal nerve exit regardless of changes in surrounding structures. The endosseous labyrinth of Proganochelys quenstedti is slightly distinct from that of crown-turtles in being more compact and robust, with short and thick semicircular canals and a low crus communis resulting in almost horizontally oriented canals (Figure 4). The anterior and posterior semicircular canals (ASC and PSC, respectively) are nearly at the same level as the lateral semicircular canal (LSC), whereas in other turtles the first two run dorsally in relation to the last (Carabajal et al., 2013; Mautner et al., 2017; Paulina-Carabajal et al., 2017; Ferreira et al., 2018). The angle between the ASC and LSC is also very wide (Table 1), with similar values to meiolaniids and tortoises (Paulina-Carabajal et al., 2017). This combination of features suggests that the semicircular canals of P. quenstedti were not very sensitive during movements within the sagittal (head moving up and down) and coronal planes (head tilt) (Brichta et al., 1988; Spoor et al., 2007; David et al., 2010). Instead, the LSC was likely more effective in stabilizing gaze during yaw movements (head moving left and right). Thus, the labyrinth anatomy of P. quenstedti indicates this species was slow and non-agile (Spoor et al., 2007; David et al., 2010), compatible with a highly terrestrial and possibly fossorial lifestyle. This is also tentatively indicated by its position in morphospace outside of, but close to, terrestrial and fossorial groupings in the shape analysis (Figure 6). Although the cervical vertebrae of P. quenstedti were capable of a certain level of mobility (Werneburg et al., 2015a), its short neck coupled with the relatively low carapace, strong osteoderms on the dorsal neck surface and cervical ribs (Gaffney, 1990) imply restricted mobility along the same planes (sagittal and coronal) (Werneburg et al., 2015a,b) as indicated by its labyrinth morphology. Crown-turtles, however, evolved longer necks and several taxa are capable of complex and, sometimes, very fast neck and head movements (Poglayen-Neuwall, 1953; Herrel et al., 2008; Werneburg et al., 2015a,b). This could be related to the apparent increase in size of the semicircular canals in crown-turtles (Spoor, 2003; Spoor et al., 2007) when compared to those of P. quenstedti (although when compared to more agile reptiles, all turtles possess short canals; Witmer et al., 2008). Hearing was likely not well-developed in P. quenstedti, given the small overall size of the endosseous cochlear duct (Walsh et al., 2009) in comparison to other turtles. Even though its quadrate does not form the characteristic lateral round structure that encloses the cavum tympani in crown-turtles (Figures 4F–H), it possibly had a tympanic ear similar to those of extant squamates and cheloniids, in which the tympanum is supported by both bone and connective tissue (Henson, 1974; Gaffney, 1990). However, the stapes of P. quenstedti was much stouter than that of crown-turtles (Figures 4D,E), and possibly articulated with the quadrate (Gaffney, 1990), suggesting that it was not as effective as the thin vibratory element characteristic of extant amniotes with tympanic hearing, including modern turtles (Baird, 1970; Clack, 1997). As proposed by Clack (1997) for diapsids, elongation of the paraoccipital process of the opisthotic and its tight suturing to the squamosal, which occurred in the group including all testudinates but Proganochelys quenstedti (Sterli et al., 2010), may have completely released the stapes from its ancestral structural function (connecting the quadrate to other elements of the braincase) during turtle evolution. The nasal cavity of P. quenstedti represents at least 42.2% of the total endocast volume (Table 1), fitting in the volume spectrum of terrestrial turtle taxa, which ranges from 29 to 43% in tortoises and 58.5 to 64% in meiolaniids (Carabajal et al., 2013). Larger nasal cavities have been related to occupation of arid environments, thermoregulation, sound-production or higher olfactory capabilities (Parsons, 1959, 1970; Paulina-Carabajal et al., 2017). In P. quenstedti, the cavum nasi proprium represents most of the volume of the nasal cavity and extends far dorsally and posteriorly. Within the nasal cavity, sensory epithelium occurs only on the cavum walls (Parsons, 1970), and, as such, the cavum's relative size could be used as a proxy for inferences about olfactory capability in extinct reptiles. This connection, however, should be interpreted cautiously, due to the possible relation between cavum size and other functions, such as thermoregulation or vocalization (Bourke et al., 2014; Paulina-Carabajal et al., 2017). The size and volume of the olfactory bulbs have been shown to be related to a greater reliance on the olfactory sense in mammals and birds (Bang, 1971; Bang and Wenzel, 1985; Healy and Guilford, 1990; Gittleman, 1991). In a series of studies the olfactory ratio (ratio between olfactory bulb and cerebral hemisphere maximum diameters; OR values) were used as a proxy to study olfactory acuity and capacity in theropod dinosaurs (including birds) and crocodilians (Zelenitsky et al., 2009, 2011). More recently this has also been applied to turtles (Paulina-Carabajal et al., 2017), showing that tortoises and meiolaniids (both terrestrial taxa) have the highest OR values (36–62 and 20–45%, respectively). Even though OR may not be an exact measure of olfactory acuity it is currently the best available proxy and its use for a variety of reptilian taxa (Zelenitsky et al., 2009, 2011; Paulina-Carabajal et al., 2017) makes it a useful comparative metric. Here, we show that the OR is even higher in P. quenstedti, between 57 and 62% (Table 1), but in this case, these values may be also related to the less-developed cerebral hemispheres rather than to larger olfactory bulbs. Nevertheless, the large nasal cavity in association with the high OR values supports our hypothesis that olfaction was possibly the most developed sense in P. quenstedti. In the shape analysis, Proganochelys quenstedti is not contained in the morphospace occupied by any of the considered phylogenetic groups (Figure 5). There is extensive overlap in the PCA plots, but, at the same time, the PERMANOVA test shows a separation between Lepidosauromorpha, Testudinata and Archosauromorpha (Table 3). 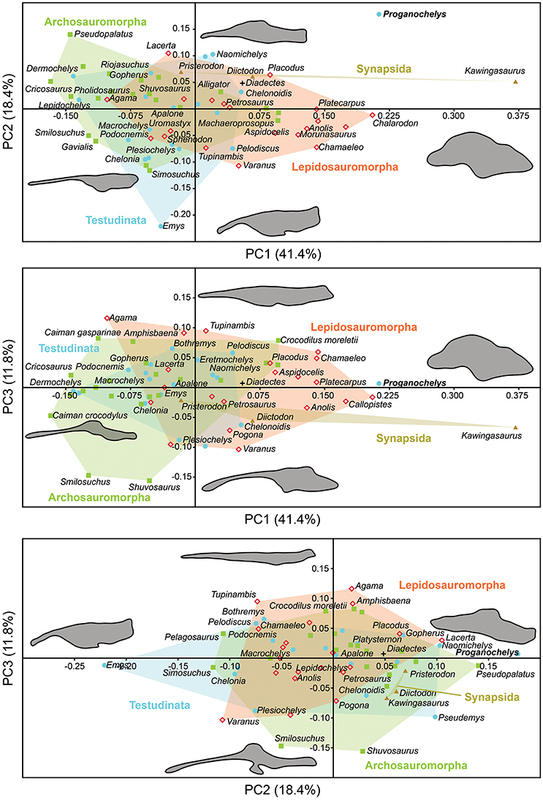 These results suggest that all amniotes (excluding dinosaurs and mammals) share a similar plesiomorphic brain endocast morphology, but that those lineages evolved in different directions in the morphospace. Comparing general ecological groups (freshwater, marine, terrestrial, and fossorial) provided similar results, with extensive overlap among the occupied morphospaces (Figure 6). P. quenstedti is contained in the morphospace occupied by the fossorial group on the PC1/PC3 plot, but it falls outside every group on the other plots. Additionally, the statistical tests do not support significant differences between any of the considered groups (Table 3). On the other hand, the minimum spanning trees (see Supplementary Material) show that even when inside the fossorial morphospace P. quenstedti is closest to Placodus, a marine lepidosauromorph, and Pseudopalatus, an aquatic archosauromorph. A phylogenetic proximity to Sauropterygia (the lepidosauromorph lineage that includes Placodus) has been proposed previously (deBraga and Rieppel, 1997) and is associated with the hypothesis that turtles originated in marine environments (Joyce and Gauthier, 2004; Joyce, 2015). The proximity of P. quenstedti and Placodus in our PC1/PC2 plot (Figure 6) may recall this hypothesis, but the poor sampling of sauropterygians together with the extensive overlap between all groups (phylogenetic and ecological) cause us to refrain from considering this a robust interpretation. The shape analysis presented here is the first attempt to explore the evolution of neuroanatomy in amniotes with a quantitative approach. Even though our results do not support inferences about lifestyles from neuroanatomical data, the significant separation between some of the considered phylogenetic groups (Figure 5, Table 3) seems promising. We can identify some caveats in our sample (e.g., few marine reptiles, synapsids and early amniotes) that can be easily overcome with the increasing use of computer tomography in paleontological and anatomical studies. Our approach using sagittal cross-section outlines could have also influenced the results, since there is a loss of information when the 3D endocast is simplified to a 2D outline. More recently, Lyson et al. (2016) thoroughly analyzed the morphology of Eunotosaurus africanus, identifying some osteological correlates that led them to conclude that it was likely well-adapted for fossoriality. The authors also identified some of those correlates (e.g., large claws) in other proto- (e.g., Odontochelys semitestacea) and stem-turtles (Proganochelys quenstendti and Palaeochersis talampayensis), concluding that “fossoriality played an important role in the early evolution of turtles” (Lyson et al., 2016). Although in the PC1/PC3 plot (Figure 6) P. quenstedti is contained in the fossorial morphospace, the minimum spanning tree (see Supplementary Material) shows it to be closest to the terrestrial non-fossorial taxon Chalarodon and the statistical analyses do not support any significant differences between the considered groups (Table 3). While the shape analyses do not shed light on this problem conclusively, other sources of data are more convincing. Proganochelys quenstedti fossils were found in continental deposits (Gaffney, 1990) and analyses of forelimb proportions (Joyce and Gauthier, 2004) and paleohistology (Scheyer and Sander, 2007) support it as a terrestrial turtle. The morphology of its endosseous labyrinth with short semicircular canals oriented at high angles to each other and the large cavum nasi proprium (Parsons, 1970; David et al., 2010; Paulina-Carabajal et al., 2017) agree with these previous studies, strongly supporting the interpretation that P. quenstedti was a well-adapted terrestrial turtle. However, since its vestibule is not particularly large, in contrast to the condition of truly fossorial taxa (Yi and Norell, 2015) or of the semi-fossorial tortoise Gopherus (Paulina-Carabajal et al., 2017), the present data suggest it was likely not a fossorial taxon. In P. quenstedti, the relatively enlarged vestibule in comparison to the other turtles in this study results from the relatively small semicircular canals. Thus, even if fossoriality had an important role during the early evolution of shell components (Lyson et al., 2016), our data suggests the complete turtle shell first appeared in a terrestrial taxon, with no evident link to fossoriality (at the Testudinata node). If we assume that the relatively simple morphology of P. quenstedti closely resembles that of the testudinate ancestors, some trends can be inferred for the evolution of endocranial structures in turtles. An increase in overall encephalization, for example, with longer and more voluminous endocasts in relation to skull length is found already in the stem-turtle Naomichelys speciosa and continues in crown-turtles (Figures 2, 3). Some regions became more pronounced as well. In N. speciosa, meiolaniids (Paulina-Carabajal et al., 2017), Plesiochelys etalloni (Carabajal et al., 2013) and all other crown-turtles (Mautner et al., 2017; Ferreira et al., 2018) the cerebral hemispheres are clearly distinguishable from the remainder of the endocast and are wider in relation to skull and endocast length than in P. quenstedti (Figures 2, 3). The olfactory bulb can also be seen in the endocasts of some taxa, e.g., Testudo graeca and Plesiochelys etalloni (Carabajal et al., 2013; Paulina-Carabajal et al., 2017). However, this does not seem to be a general trend but rather one of the features that show noteworthy variations among crown-turtles, as are the degree of development of the cephalic and pontine inflections and the sizes of the nasal cavity and the orbits. Considering that the brain of P. quenstedti was a simple tube-like structure with poorly differentiated regions, an increase in size and in regionalization of the brain took place later during the course of turtle evolution, similarly (although in a much lesser degree) to the trend observed during bird evolution (Balanoff et al., 2013), and achieved an endocast diversity comparable to other groups of amniotes, such as lepidosaurs and archosaurs (excluding dinosaurs; Figures 5, 6). Indeed, extant turtles possess high brain weights in relation to body weight, comparable to that of crocodiles (Gürtürkün et al., 2016), but that was not the ancestral condition of the group based on our analyses. Given the recurrent results of phylogenetic analyses suggesting that turtles have parareptilian affinity (e.g., Laurin and Piñeiro, 2017), it is important to sample the endocast diversity in that clade and explore the similarities between turtles and all other reptilian lineages. The simpler brain structure together with the large nasal cavity and nearly horizontal and short semicircular canals of the inner ear supports a picture of P. quenstedti as a terrestrial but most likely not fossorial turtle, with likely mediocre hearing and vision, but a well-developed olfactory sense. SL and IW: conceived and designed the study; SL: performed the three-dimensional reconstruction; IW: provided digital datasets; SL, GF, and IW: collected, analyzed and interpreted the data; SL and GF: created figures and supplementary data; SL, GF, and IW: contributed equally to the discussion, preparation and writing of the paper. This research was funded by FAPESP (Fundação de Amparo à Pesquisa do Estado de São Paulo) grants 2016/03934-2 and 2014/2539-5 to GF and by SNF (Schweizerischer Nationalfonds zur Förderung der Wissenschaftlichen Forschung advanced postdoc mobility grant P300PA_164720 to IW. We thank Daniela Schwarz for sharing the μCT-scan of the Berlin specimen, and Rainer Schoch for the permission to μCT the Stuttgart specimen of Proganochelys. We thank Walter G. Joyce, Bill Simpson and Virginie Volpato for access to the specimens and CT scan data of Naomichelys and Emys. Adrian Tröscher, Jan Prochel, Irina Ruf, and Kristin Mahlow are thanked for help with μCT-scans of extant species. We thank Gabe S. Bever and Walter G. Joyce for useful comments on a previous version of the manuscript and the three reviewers that provided insightful comments and suggestions on the latest version of the manuscript. Baird, I. L. (1970). “The anatomy of the reptilian ear,” in Biology of the Reptilia, eds C. Gans and T. S. Parsons (London: Academic Press), 193–275. Bang, B. G., and Wenzel, B. M. (1985). “Nasal cavity and olfactory system,” in Form and function in birds, eds A.S. King and J. McLelland (New York, NY: Academic Press), 195–225. Crampton, J. S., and Haines, A. J. (1996). Users' Manual for Programs Hangle, Hmatch and Hcurve for the Fourier Shape Analysis of Two-Dimensional Outlines, Vol. 96. Science Report, Institute of Geological and Nuclear Sciences. Franzosa, J. W. (2004). 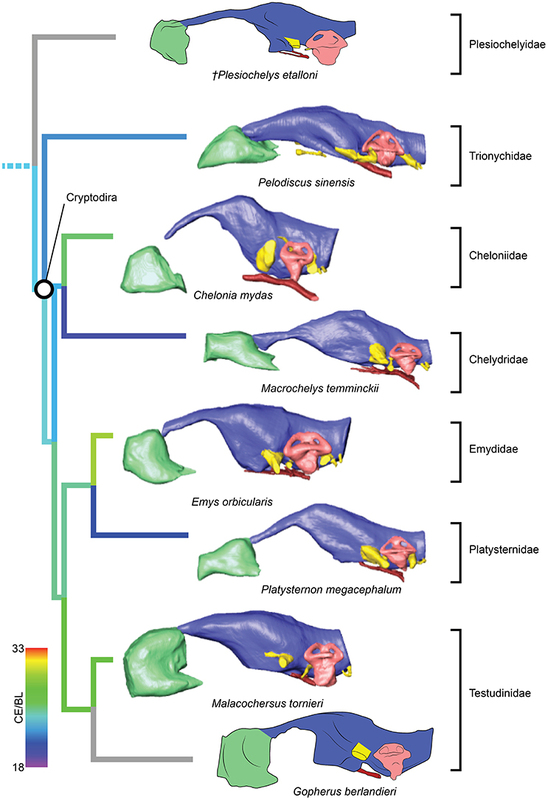 Evolution of the brain in Theropoda (Dinosauria). Ph.D. Dissertation, University of Texas, Austin, TX. Gaffney, E. S. (1979). Comparative cranial morphology of Recent and fossil turtles. B. Am. Mus. Nat. Hist. 164, 65–376. Gaffney, E. S. (1982). Cranial morphology of the baenid turtles. Am. Mus. Novit. 2737, 1–22. Gaffney, E. S. (1990). The comparative osteology of the Triassic turtle Proganochelys. B. Am. Mus. Nat. Hist. 194, 1–263. Gaffney, E. S. (1996). The postcranial morphology of Meiolania platyceps and a review of of the Meiolaniidae. B. Am. Mus. Nat. Hist. 229, 1–166. Gaffney, E. S., and Zangerl, R. (1968). A Revision of the Chelonian Genus Bothremys: (Pleurodira: Pelomedusidae). Chicago, IL: Field Museum of Natural History. Gauthier, J. A., Kluge, A. G., and Rowe, T. (1988). “The early evolution of the Amniota,” in The Phylogeny and Classification of the Tetrapods, Vol. 1, ed M. J. Benton (Oxford: Oxford University Press) 103–155. Guillon, J.-M., Guéry, L., Hulin, V., and Girondot, M. (2012). A large phylogeny of turtles (Testudines) using molecular data. Contrib. Zool. 81, 147–158. Gürtürkün, O., Stacho, M., and Ströckens, F. (2016). “The brains of reptiles and birds,” in Evolution of Nervous Systems, Vol. 1, ed J. H. Kaas (Oxford: Academic Press), 171–221. Halpern, M. (1992). “Nasal chemical senses in reptiles,” in Biology of the Reptilia, Vol. 18, eds C. Gans and D. Crews (Chicago, IL; London: University of Chicago Press), 423–523. Hammer, Ø., Harper, D. A. T., and Ryan, P. D. (2001). Past: paleontological statistics software package for education and data analysis. Palaeontol. Electr. 4, 1–9. Henson Jr, O. (1974). “Comparative anatomy of the middle ear,” in Auditory System, eds W. D. Keidel and W. D. Neff (Berlin: Springer Verlag), 39–110. Herrel, A., Van Damme, J., and Aerts, P. (2008). “Cervical anatomy and function in turtles,” in Biology of Turtles, eds J. Wyneken, M. H. Godfrey, and V. Bels (New York, NY: CRC Press), 163–185. Hopson, J. A. (1979). “Palaeoneurology,” in Biology of the Reptilia, Vol. 9, ed C. Gans (New York, NY: Academic Press), 39–146. Parsons, T. S. (1970). “The Nose and Jacobson's Organ,” in Biology of the Reptilia, Vol. 2B, ed C. Gans (New York, NY: Academic Press), 99–191. Rieppel, O. (2007). “The Relationships of Turtles within Amniotes,” in Biology of Turtles: from Structures to Strategies of Life, eds J. Wyneken, M. H. Godfrey, and V. Bels (Boca Raton: CRC Press), 345–353. Rieppel, O. (2013). “The evolution of the turtle shell,” in Morphology and Evolution of Turtles, eds D. B. Brinkman, P. A. Holroyd, and J. D. Gardner (Heidelberg: Springer), 51–61. Rohlf, F. (2010). TPSDig2, Version 2.16. New York, NY: Stony Brook. Schoch, R. R., and Sues, H.-D. (2017). Osteology of the Middle Triassic stem-turtle Pappochelys rosinae and the early evolution of the turtle skeleton. J. Syst. Palaeontol. doi: 10.1080/14772019.2017.1354936. [Epub ahead of print]. Schumacher, G. H. (1973). “The head muscles and hyolaryngeal skeleton of turtles and crocodilians,” in Biology of the Reptilia, eds C. Gans and T. S. Parsons (London; New York, NY: Academic Press), 101–200. Spoor, F. (2003). The semicircular canal system and locomotor behaviour, with special reference to hominin evolution. Courier-Forschungsinstitut Senckenberg 243, 93–104. Werneburg, I. (2011). The cranial musculature of turtles. Palaeontol. Electron. 14, 1–99. Witmer, L. M., Ridgely, R. C., Dufeau, D. L., and Semones, M. C. (2008). “Using CT to Peer into the Past: 3D Visualization of the Brain and Ear Regions of Birds, Crocodiles, and Nonavian Dinosaurs,” in Anatomical imaging, eds H. Endo and R. Frey (Tokyo: Springer), 67–87. Zangerl, R. A. (1960). A new specimen of Desmatochelys lowii Williston; a primitive sea turtle from the Cretaceous of South Dakota. Fieldiana Geol. 14, 7–40. Copyright © 2018 Lautenschlager, Ferreira and Werneburg. This is an open-access article distributed under the terms of the Creative Commons Attribution License (CC BY). The use, distribution or reproduction in other forums is permitted, provided the original author(s) and the copyright owner are credited and that the original publication in this journal is cited, in accordance with accepted academic practice. No use, distribution or reproduction is permitted which does not comply with these terms.